Every year there are new attractions and things to see, but each year we welcome back some old favourites who come to the show year on year to help make it the vibrant day out that it is. 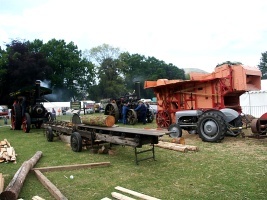 A fairly new feature of the show is a threshing and wood sawing demonstration, using agricultural steam engines. Tom Henderson of Whitney on Wye supplied the power to the threshing machine with a Fowler 7hp engine, first used by the Jockey Club at Newmarket in 1901. She then spent some time threshing in West Suffolk before being laid up in 1947. She was bought for preservation in 1962. Her power went to a Marshall 54” threshing machine bought from Robert Coles, of Shaftesbury, Dorset in 2003 by Chris Folley of Dimmock, Glos. The thresher, mostly made of wood was found in a shed, stripped completely and rebuilt. Chris explained that he preferred to thresh with proper corn and grows his own wheat to feed the big machine. He thinks it dates from 1920 from the Cambridge area. 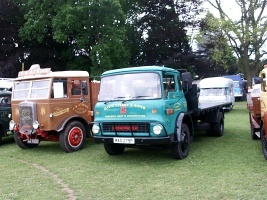 Elsewhere on the park were the Scammell Register Display, a record of all Scammells to register lorries being sold or scrapped. In an interesting line of veteran commercials, were newcomer Kington-based Steve Marriott’s Light Haul Bedford which has been used every day since he bought it in 1976. An International C30, right out of the Depression, built in 1936 and found rotting on a farm in Kansas. Brought to the UK by a collector in Chichester and bought off Ebay by Jason Allan, from Ross-on-Wye. The truck is in original condition with the minimum of work done to it to preserve it and make it roadworthy. True romance in the steam haze. Ken and Shirley Morgan met in the early fifities when he was a double decker driver on the Gloucester to Cardiff run and she became his clippie. When romance blossomed the couple had to apply to the depot manager in Newport to get married because liaisons between staff was officially frowned on. The Newport manager proved not too keen on the idea, but success came when the couple went over his head to the area manager in Monmouth. They worked the long run from Gloucester to Cardiff for many years, based in Chepstow. According to Ken they almost certainly crewed the Red Line double decker during that time, and Ken helped on its restoration when it was retired in 2003 in Cinderford. 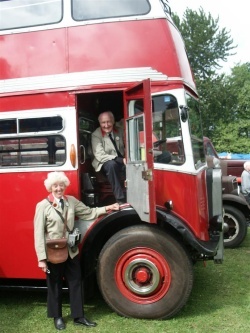 A year later the couple bought their bus and have been showing it ever since, resplendent in their uniforms. “We lived on the main Chepstow Road, right next to the Red Line bus-stop,” remembers Shirley, “and we had to get married although not in the way they mean nowadays.” The couple and their bus now live in Middlesex, but the trip back to Abergavenny is a reunion must. A star of the motorcycle display was a Brough Superior showed by Ken Baxter of Pontypridd, easily the most valuable bike on the park. The bike was made in Nottingham in 1938, a batch of five delivered to the Metropolitan Police and probably went through the London blitz. “I bought the bike in 1985 from a dealer in Newport,” said Ken. “At that time the bike was fairly rare but it did not have the collectors value it has today. I think there are about 400 left running worldwide now.” The Brough is worth between £40 and £50,000. David Tod runs the cars section, an eclectic mix of over 200 veteran and vintage cars reflecting the various chapters of motor car evolution. 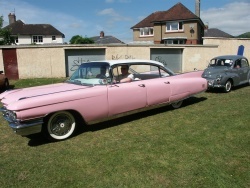 A 1913 Crossley was one of the oldest, with a De Lorean, a pink Cadillac, and every British marque of the fifties and sixties in pristine condition. According to David: “This is a great attraction for the show, and owners are pleased to bring their cars from hundreds of miles away. We have lots of old friends who are here year on year, and newcomers who we want to see again. It is without doubt a fantastic addition to the show”.